Trends Shaping The Future Of Imagery #Infographic ~ Visualistan '+g+"
Working with thousands of artists from all over the world, Shutterstock has one of the most extensive collections of imagery, capturing life on all continents. 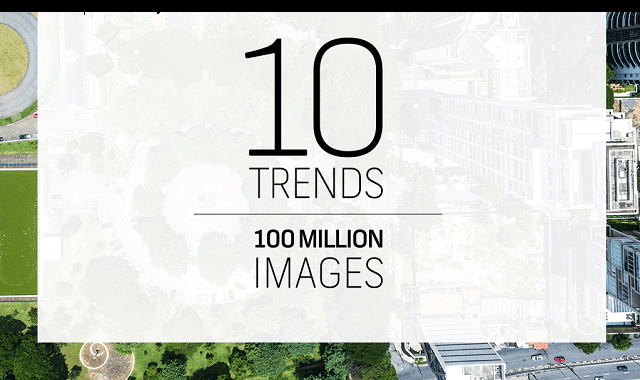 They recently celebrated the milestone of their collection containing 100 million images and to celebrate created an infographic looking at some of 2016’s top image trends. Whether it’s images celebrating unique street style, futuristic fantasy images of what life could be like, unposed and unfiltered natural shots from across the globe, or drone photography, today’s photographers are creating unique and timeless images and sharing their work via Shutterstock. Driven partly by advancing technology and partly by increased social connectivity, today it is easier than ever to create and share beautiful imagery. Image trends keep changing and diversifying, with photographers looking to new tools and editing software to create unique images that simply wouldn’t have been feasible in the past. With enhanced tools comes enhanced creativity, and that has never been more apparent when looking at some of the most popular images of the year.